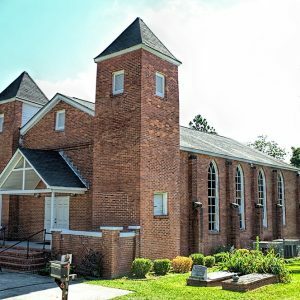 Providence Baptist Church was established by enslaved and free people of African descent in the town of Hamburg. After the Civil War, Hamburg became a center of African American political power in Aiken County. In 1868 three members of the Providence Congregation — John Gardner, Prince Rivers, and Samuel Lee — won election to the S.C. legislature. All three would rise to greater political prominence during the era of Reconstruction. In 1929 a massive flood inundated Hamburg and forced residents to move to higher ground. The Church was dismantled and rebuilt atop the 75 foot bluff behind the old town.